One day back in 1959 my dad received a visit from an old war buddy of his. He was an older man and had just moved into a very nice new home in La Puente not far from where we lived in Southern California. Dad called the man Irwin, but I don’t know if that was his first name, or his last name. I wasn’t privy to any of their war stories so I don’t know what they had seen or done, or even what outfit they served in together. Dad was very respectful of him though, and called him sir, but in those days my dad called every man he met “Sir,” even the kid who dished up the pizza at the drive-in was accorded the better benefit of the doubt from my father. I don’t know if it had been drummed into him in the brig, or earned in the field, but it was a habit that he never lost, nor did he ever try to shake it. In Irwin’s case, I somehow sensed that he meant it a little more. Dad wore a shirt that morning just for Irwin, a long sleeve shirt, which he never did. Til then, I didn’t know he owned a dress shirt, other than his special pearl-colored embroidered short-sleeve shirt that he wore to Vegas with his grey slacks and red ox-blood shoes. But that one was really special. He even had mom take a picture of them with me and my little sister, and just before the picture was taken he bent down and buttoned my top shirt button. Dad had a lot of respect for Irwin, and it showed. 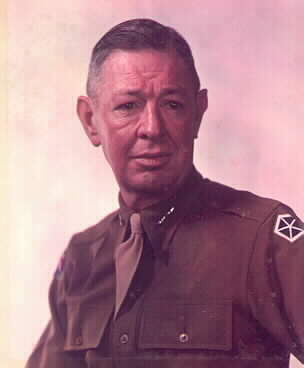 After I learned a little more about the Army and WWII, I thought he might have been General Stafford Irwin, who had been a classmate of General Omar Bradley at West Point and was “his” war buddy in Europe. Irwin looked a lot like General Irwin. And Dad had always loved General Bradley, and would talk like he knew him when Walter Cronkite would mention his name on The Twentieth Century, which we watched together every week, and he even called himself a “loner” like the General. But General Irwin died in 1956, and this man was still alive in 1959. I guess he just had one of those common, everyday faces. Note: If anybody recognizes the man in the top photo as Grandpa Irwin or Uncle Irwin, please send me an email and tell me all about him. I’d love to hear it.